There are several ways of testing concrete strength, including the use of a rebound hammer such as the “Digital Schmidt Hammer”. This non-destructive testing method used in accordance with Australian Standards records an estimation of the concrete’s (megapascals) MPa. Used in conjunction with GPR (to determine areas free of reinforcing to allow no false readings) the hammer records and analyses the impact and post impact data to determine the estimate strength of concrete. 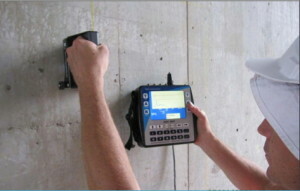 Another way of testing concrete strength is by using a Windsor probe. This method involves penetrating the surface of a test sample using a hardened steel probe and the strength of the test sample correlates to how deep the probe penetrates. However, in most cases, the strength varies from one test point to another. The third method (Destructive testing) is a compressive strength test that involves applying an axial load to a concrete specimen at a uniform rate until it fails (MPa). This involves delivering a core sample of a minimum size 150mm long by 75 wide (Ratio 2/1) and crushing it to deliver the MPa of the core. Once again the use of GPR is necessary to allow the core to be free of reinforcing. One way of determining concrete density is by filling a container of known volume with concrete and then weighing it. This gives a concrete contractor a good idea of the volumetric quantity of concrete as well as the air content. A study carried out by the Can Tho University in Vietnam found that a weighing scale sensitive to about 0.3% of concrete mass one wants to weigh gives the best results. A construction expert can also determine concrete density using a pressure meter. To discuss the above investigations and free quoting or to enquire about testing that might not be here, please contact Steve on 0427 827 692 or by email steve@scanconcrete.com.au. If you need to drill, core or cut concrete you might also be interested in our concrete scanning services.